Rev. John Spilio (nee’ Ioannis Papaspiliopoulos) was born in Piraeus, Greece in 1932. He studied painting in Athens, Greece, Florence, Italy, and Paris, France. Of all his teachers he was most influenced by the outstanding Byzantine iconographer, the late professor and Master iconographer, Photis Kontoglou. He exhibited his work several times in Athens, Piraeus and later in Paris. In 1963, Rev. Spilio came to the US, invited by the Greek Orthodox Archdiocese. His work bears his personal style while simultaneously adheres to the pure dogmatic and liturgical style of the Byzantine iconographic protocol. Rev. Spilio was the founder of the Byzantine Icons Studios, where many of today’s iconographic apprentices learned the secrets of the Orthodox Ecclesiastical art. Rev. Spilio devoted more than 45 years of his life for the glory and beauty of the church. As a result, and through a long family tradition, he was ordained a priest on August 6, 1988, and fulfilled his religious beliefs for the Orthodox Christian Church. Through a long, successful career, Rev. Spilio has a record of 82 fully decorated churches in the USA, Canada and Greece, including the Chapel in the residence of His Eminence Archbishop Iakovos (former Archbishop) and the chapel of St. Iakovos in the summer camp of the Archdiocese in Greece. Also, hundreds of portable art works of his exist at galleries and private collections throughout the world. Rev. Spilio regularly lectured, published articles, participated in organizing exhibitions and seminars, and was generally committed in projecting the true form of religious representation that is “Orthodox Byzantine” art. Rev. John Spilio (née Papaspiliopoulos) died peacefully on May 19, 2013 at the age of 81. Papayianni, as he was known to his friends and parishioners, was a master iconographer and Greek Orthodox priest. He was brought to the United States by His Eminence, the late Archbishop Iakovos of North and South America. 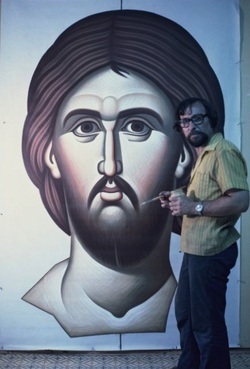 In his lifetime, Papayianni created icons and art for more than 80 churches nationwide and internationally, in most cases designing churches in entirety. He was born in Piraeus, Greece and orphaned of his father at the age of 2 during World War II along with his two older brothers, later serving in the Greek Army, all the while studying the art of icons. Papayianni’s life was an epic story of immigration and love for the opportunity that America provided. He melded both cultures effortlessly. His ordination into the priesthood in 1988 was a turning point for him personally and he continued to serve his community through his mission and artwork. He is survived by his loving and devoted wife Mary, his daughter and iconographer Katerina, and his cherished granddaughters, Ariadne and Alexandra, in New York; and his brothers, retired surgeon Polykarpos and retired Reverend Ignatius, and their families in Athens. His passion, love of adventure and leadership will be deeply missed. His legacy and memory live on forever, palpably in his daughter’s brushstroke and perspective, and in his granddaughters’ artistic talent. Viewing at Holy Cross Greek Orthodox Church, 8401 Ridge Boulevard, Brooklyn, NY 11209, on Tuesday May 21, 2013 from 2-4:30, 6-9PM. Funeral Service will be held on Wednesday, May 22, 2013, at Holy Cross Greek Orthodox Church at 10AM, followed by Interment at Sleepy Hollow Cemetery, Sleepy Hollow, NY 10591. Donations can be made in his name to the Restoration Funds of either Holy Cross (718-836-3510) or Annunciation (212-724-2070).